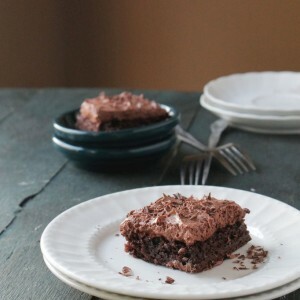 You should make these chocolate mousse brownies ASAP! You will definitely enjoy them as much as we did. Line a 9x13-inch baking pan with foil and grease lightly with cooking spray; set aside. In a large mixing bowl, whisk together the sugar, brown sugar, melted butter, milk, eggs, and vanilla. In a separate mixing bowl, combine flour, cocoa, baking powder, and salt. Fold the dry ingredients into the wet until combined. Bake for 18-20 minutes, or until a toothpick inserted into the center comes out with few moist crumbs. Place all ingredients in a mixing bowl and whip until mixture holds a stiff peak. Remove the cooled brownies from the pan by holding onto the sides of the foil. Spread the chocolate mousse frosting over the entire cake; cut into squares, garnish with grated chocolate, and serve.